Read about the farm walk that was recently held for the Soil Farmer of the Year with runner up for 2017 Richard Boldan. On a rainy evening, some brave farmers met up to learn more about how Richard is managing his farm to build soil health and resilience. The evening was fantastic, despite the weather, and my technology didn’t hold up; the Yorkshire rain was a little too much for my iPad which has not worked since and has all the videos and photos of the evening. However below are a few more details about Richard’s farm and how he is managing it, along with some pictures that I took on the judging visit (when it was beautifully sunny). Richard farms 185 acres which includes combinable crop and vining pea enterprises. His soil type is split between lighter sandy loam soils and heavier silty clay loam. 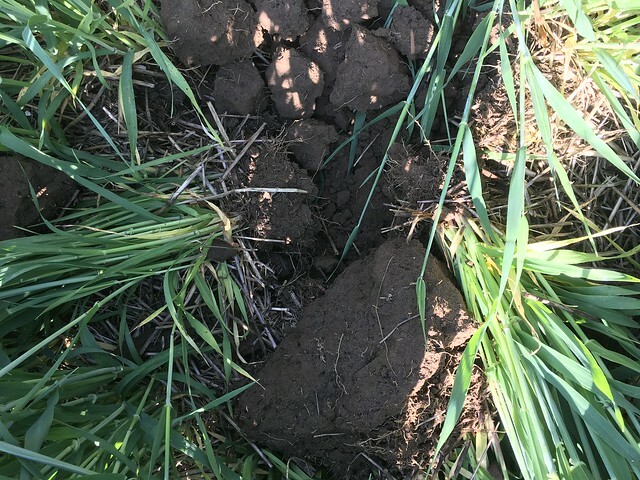 His main risk on-farm with his soils is moisture, as periods of extreme dry hot weather on the lighter land can result in drought stressed crops. Richard changed his management to a direct drill system two years ago. His inspiration moment was while attending an AHDB monitor farm meeting on soil health. He realised that although he thought that he was doing the right thing in terms of adding organic matter by using manures and grass leys, he wasn’t doing anything to preserve that organic matter in the soil and look after it. Since moving to the direct drill system using a JD750 he is convinced of the benefits. This year, despite the dry weather, his spring crops all established which he puts down to not disturbing the soil and allowing the roots to penetrate and find moisture. Richard also uses cover crops, and his ambition is to keep a living root in the soil at all times. He has found that any cover crop is better than nothing, and there isn’t a need to have expensive mixes. Richard has also been pivotal in engaging the pea supply chain in trying to see the benefits of the direct drill system and has been involved in pioneering the first research project which assesses the benefits to the pea crop of using cover crops and also what happens when you direct drill the peas. The trials are just finished for the first year of three so there is a few more years of data to analyse before there will be definitive data. Thank you to Richard for a fantastic evening in less that ideal weather conditions!